I gave this speech on Mothers Day 2002 as testimony for Mothers Day services at church. In January 2002 I had torn my Achilles tendon, so I had been off work and in a wheelchair for an extended period of time. 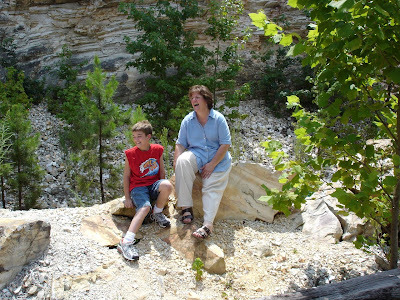 Sam was 8 when I wrote this and he was 9 in the picture above from our vacation to Hot Springs, Arkansas. Things haven’t been easy for me the past few months. The whole world looks a lot different from a wheelchair and the electric carts that you find in grocery stores and Wal-Mart. Stairs have never looked so difficult, and running has never looked so appealing. Walkers and canes and casts aren’t all they are cracked up to be! I have always known that I make a better nurse than a patient. But, I believe things happen for a reason, to open your eyes to a new frame of mind, to put you in someone else’s shoes. When my son was born 8 years ago, I remember thinking that things would be perfect, that everything would go as planned. I was not prepared for a sick baby, for not being able to hold my son whenever I wanted to, for not taking Sam home with me when I left the hospital. I was accustomed to taking care of other peoples kids…I do that for a living. But I never really considered what it felt like to be on the other side of the crib. I was aware that most new moms cried a little and some new moms cried a lot. I always offered Kleenex with the first tear, and I patted a lot of shoulders and offered encouraging words. But I always wondered what was so hard for these moms. When it came time to leave the hospital without my son, I was inconsolable. Nothing had prepared me for leaving Sam there, to be cared for by nurses who I knew and also trusted, but who didn’t know Sam. They didn’t know that during my pregnancy he stayed up all night with me while I was at work and he slept during the day, they didn’t know that he had hiccups most of the time, that he kicked like crazy after I ate gummy fish. They didn’t know that he lay very still and quiet inside me while I was in the doctor’s office, when the doctor wanted him to kick and be active. I managed to get though those few days. I realized there are a lot of moms who never get to take their babies home, who never are able to hold them in the night and look at them in wonder, count toes and fingers and marvel at the very miracle of life created within their own bodies. There are moms who have babies who know they cannot take care of them, who give their babies away to be loved by another woman. And there are moms who open their arms to welcome someone else’s baby as their own. There are foster moms who keep children safe until their own moms can take care of them. There are single moms by choice and single moms who never planned to be single and there are married moms. Every one of these moms has a special story. When I began to work again after my maternity leave, I cried with every mom who cried, I hugged them and told them that they would somehow get through it, that soon their babies would be home where they belonged. I told them it would be hard on them, but that soon their baby would be OK. Becoming a mother sheds a whole new light on things. Nothing can really prepare you for the uniqueness of it all. I don’t know what I did before my son was born. I had time to do anything I wanted, to pick up and go places, to walk out of the house in a second, without diapers, a change of clothes, wipes and a supply of baby food for a week. But my life was also empty in a way I didn’t know that it was empty, I didn’t know what it was like to be greeted with a smile at 4 am just because I was his mom. I didn’t know what it was like to pull smashed worms out of little jeans pockets, to hold a child who believes I can fix whatever problem he has. I hope I can always fix Sam’s owies and teach him how to love God and take care of himself and be a good person. I hope always to have his unconditional love. I have done lots of things after I became a mom that I would not have envisioned myself doing. I made a home for a mouse Sam pulled out of the mouth of a cat; I have picked up frogs and gotten up at 4 am to watch a meteor shower. I have pitched a million balls and have yelled at ballgames, I have waited patiently outside men’s bathrooms, and occasionally not so patiently, have opened the door and called my son out. I have watched over him while he was sick, I held him when he needed comforting, I have answered a million questions. I will never get tired of being a mom, it is a blessing from God, something that I greatly treasure. I hope Sam always keeps the wonder he has now for the world and life. I hope he stays well and happy and safe. I hope he loves God and his country and that he grows up to be a good man. And I hope he always loves his mom. Happy Mothers Day to all women who are mothers, who dream of being mothers, who are soon to be mothers and those who are taking care of other's children. Wow...time passes so quickly! I can't believe it has been 7 years since you gave this testimony. It's great to see how much Sam has changed since then. He is growing into the man you hoped for back then! Awesome!! You are a great mom, Ellen! Made me cry, even not being a Momma myself yet. Love it. Happy Mother's Day! That is the most lovely post, and it says it all. Thank you so much for that! !